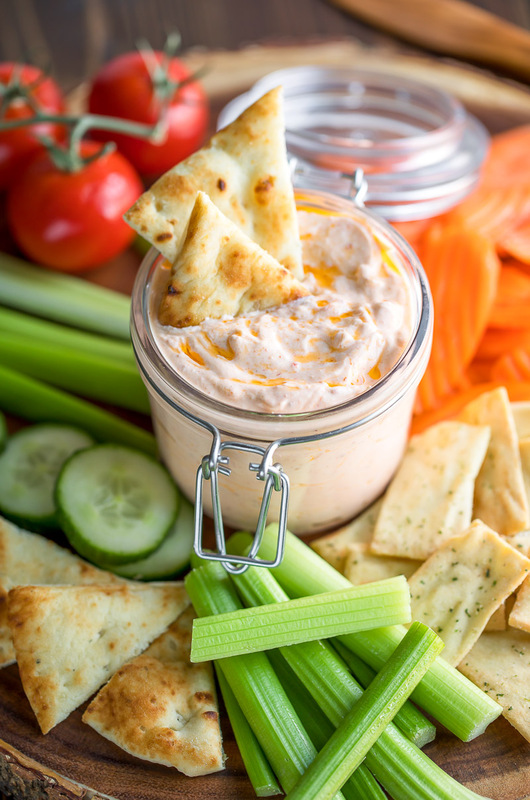 Get ready to swirl in a little spice with this zesty Harissa Yogurt Dip! New to harissa? It’s a spicy Tunisian condiment with a wonderfully versatile flavor profile! It’s spiked with aromatics like garlic, coriander, and caraway and almost has a Sriracha sort of vibe to it with a uniqueness that’s all it’s own. Some varieties are ultra-thick and spreadable while others are blended with extra olive oil making it ideal to swirl into everything from sauces to soups and also great for marinating protein and veggies destined for roasting. If you’ve been following the blog for a bit, you may have noticed quite a few harissa recipes on here. It’s such a tasty flavor boost for dips, dressings, chili, and soups galore! So far I’ve whipped up a Spicy Harissa Turkey Chili, a spicy-sweet Honey Harissa Vinaigrette, and a Spicy Moroccan Sweet Potato Soup that completely rocks my world. 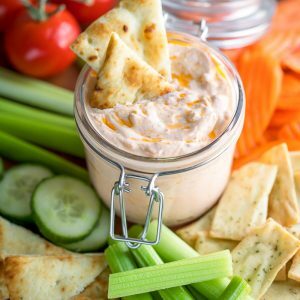 Since this zesty Harissa Yogurt Dip came out so gosh darn amazing, I may even try my hand at harissa hummus next! Ok so back to the dip. It’s deeeeelish! Add garlic and oil to a small skillet and heat to medium-high. Sauté, stirring often, for approx. 1-2 minutes until garlic is fragrant. Remove from heat once garlic begins to brown. In a large bowl, add yogurt, sour cream garlic (in oil) and season with salt and garlic powder. Add one tablespoon each of harissa paste and lemon juice and mix well. Give it a taste and if you can handle the heat, add that extra tablespoon! Loving the lemon? Add another tablespoon. I loved mine with 2 TBSP each of lemon juice and harissa paste. Mix it all together and dive in with pita and veggies or use it as a zesty sandwich spread for a pita pocket or wrap. Making it in advance? It'll stay fresh 3-4 days in the fridge. as a sandwich spread for Chicken Gyros or your favorite wrap. It's amazing with chicken salmon, shrimp, and roasted veggies! Nutrition Facts below are estimated using an online recipe nutrition calculator. Adjust as needed and enjoy! Recipe inspired by and adapted from Cabot Creamery – love them so! Chilled Veggie Dip in a Bread Bowl <– I make this like every weekend lol! 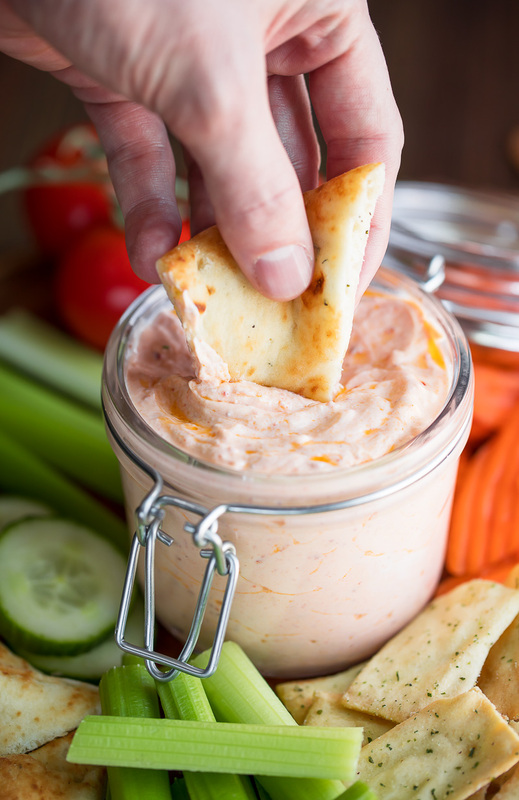 If you get a chance to try this spicy harissa yogurt dip, let me know! Leave some love in the comment form below or tag your photos with @peasandcrayons on Instagram so I can happy dance over your creation! I can’t wait to see what you whip up! I want to dip alllll this things in this delicious dip! Thanks so much for sharing! Ahhh yay! So glad you’re loving it Tayler! Such a healthy and flavorful snack! YUM!